This practical, hands-on workbook will show you how to immediately become more productive with ArcGIS by using Python to streamline and automate tasks. 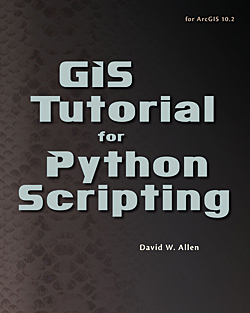 Python, the scripting language for ArcGIS, is tightly integrated with ArcMap and ArcCatalog. This book is designed for the GIS professional with limited programming experience. The author shares strategies for learning how to get things done more efficiently. Exercise data for all 24 tutorials is included as well as access to ArcGIS for Desktop via a trial copy. Learning objectives for each tutorial are supplied as well as materials the student should become familiar with before attempting the tutorial. Each exercise includes a scenario and information on the data to be used as well as step-by-step directions and tips on scripting. Instructor resources are also available. The first tutorial in the first chapter provides a brief introduction to Python. The remaining tutorials show how you can get a lot more done in the ArcMap interface using Python to create label expressions and change data formatting in the Field Calculator. The remaining chapters cover writing stand-alone Python scripts, understanding and using the ArcPy mapping module, creating Python toolboxes, and creating Python add-ins.